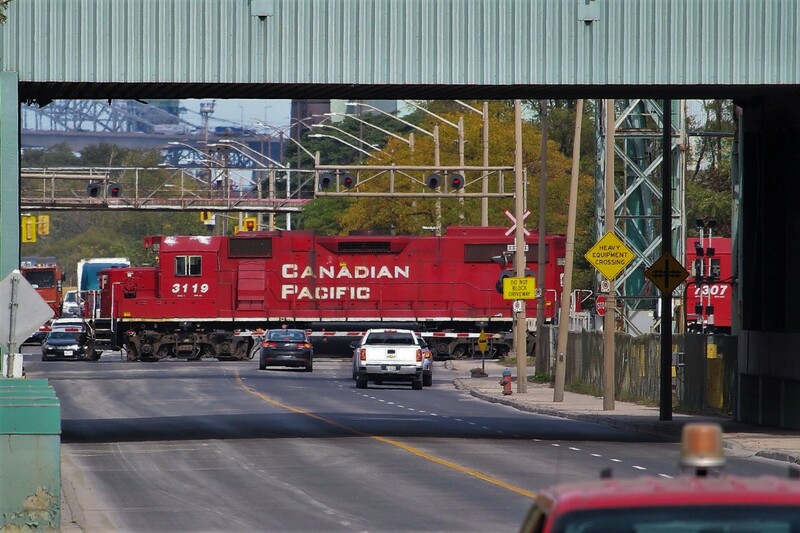 Railpictures.ca - James Knott Photo: “Heavy Equipment Crossing” on Ottawa Street North in Hamilton. I was actually heading to catch them at Main and Gage when I saw them in my rearview mirror and it reminded me of Steve’s shot with the Dofasco sign in it. Of course, that sign is gone now and the structure has changed, but it is still a neat sight to see them working the yard like this. So I pulled over near the Grimsby Sub and snapped a shot before heading along. | Railpictures.ca – Canadian Railway Photography – photographie ferroviaire Canadienne. Caption: "Heavy Equipment Crossing" on Ottawa Street North in Hamilton. I was actually heading to catch them at Main and Gage when I saw them in my rearview mirror and it reminded me of Steve's shot with the Dofasco sign in it. Of course, that sign is gone now and the structure has changed, but it is still a neat sight to see them working the yard like this. So I pulled over near the Grimsby Sub and snapped a shot before heading along.